6,459 churches by the end of 2010, an increase of 543 churches from the previous year and that after a massive clean up that saw well over a hundred out-dated entries removed from our records. The year was marked by the continued emergence of the Episcopal churches who set a new one year record for church adds by one denomination. We believe, that the Episcopal surge is not an isolated event, but indicative of a wide spread movement that is rapidly opening up church doors throughout the world. The year was marked by the continued emergence of the Episcopal churches who set a new one year record for church adds by a denomination. Currently the directory contains a little over 17% of all Episcopal churches in the United States. That’s a staggering number when you consider that churches are, by and large, listed only when they have individually requested to be added. Could a denomination wide affirming proclamation be forthcoming from the Episcopalians in the not too distant future? The surge in the Episcopal numbers isn’t to say the UCC churches have been stagnating either as they continued to post double digit growth in our directory. Last year alone they added close to two hundred churches which means that over 21% of the entire UCC denomination have now requested to be listed in our directory. Between the Episcopal and UCC churches alone they account for close to 40% of all gay affirming Christian churches we know of throughout the entire world. This is an amazing number nor do I see this trend slowing any over the next year. The Presbyterian, Lutheran and United Methodist denominations are the next three largest groups in our directory. They pose a bit of a mystery in that their double digit growth appears to be tapering off however I wonder if this is truly what is occurring or simply indicative of our inability to canvas the individual churches in more than one to two denominations a year at best (more on this later)? The two other surprising groups this year were the non denominational churches and the independent Catholic denominations. Non denominational churches face a special hurdle in that they rarely have a national body they can affiliate with and thus it’s very hard for them to be seen unless they contact us directly for inclusion in the directory. In spite of this, the non denominational church numbers continue to grow and enjoyed another year of double digit growth. Clearly the grass roots evangelical movement continues to move forward, even without the support of any large denominational or organizational body. 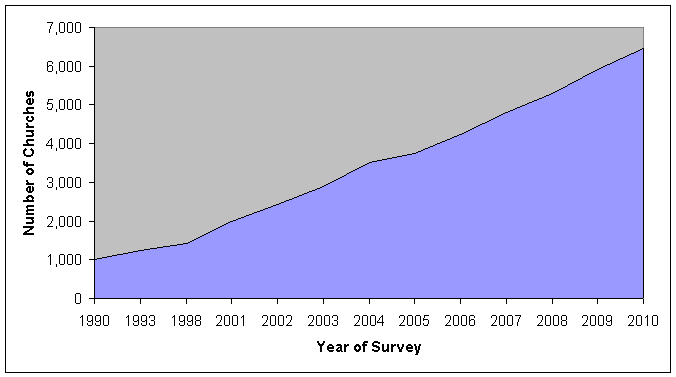 The other major trend we’ve seen is the growth in the Catholic groups that are not affiliated with the Vatican. Of course the latter has done everything possible to shut down gay affirming priests and nuns and because of this the number of welcoming Roman Catholic parishes continues to decline. Taking their place though is an ever growing cadre’ of ‘break away’ Catholic denominations and individual parishes. You see this trend most clearly in the denominational break down in the directory. Currently there are eighty six different denominations listed in the directory. 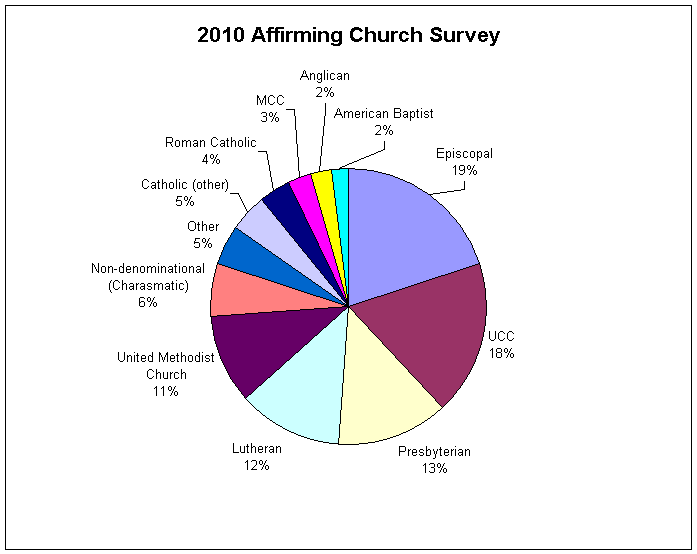 Over thirty of these denominations are in some form or fashion Catholic in nature (e.g. Old Catholic). The number of welcoming non Roman Catholic parishes added to the directory increases with each passing year. As the Roman Catholic church continues to crack down on ‘dissident’ parishes, priests and nuns I foresee this trend continuing. This past year we added over six hundred new churches however a massive clean up effort to remove churches that had closed their doors or merged with other churches gave us a net total of five hundred and forty three new church adds in 2010. In addition the directory now covers eight six different denominations spread out across forty six different countries. While the movement is still focused primarily in the United States it is rapidly gaining traction in Canada, the United Kingdom, Australia and now showing sparks of life in Europe as well. Includes all other, non Catholic denominations (e.g. Mennonite, Community of Christ, Brethren). Includes all Catholic denominations that are not associated with the Roman Catholic church (e.g. Independent Catholic, Old Catholic, American Catholic). The final trend I would like to note is the ever increasing number of gay affirming churches who are not affiliated with their particular denominations affirming organization. Needless to say this makes finding these congregations a more difficult task. In years gone by you could canvas the various gay affirming groups within each of the major denominations to see where the growth was taking place. This is no longer true, now to find new churches, Eric and I have taken to emailing all of the churches within an entire denomination to find out which ones are affirming and would like to be listed. Needless to say this is a very time consuming task. Very accurate, but very time consuming. The flip side to that is that the movement seems to have outstripped the national affirming bodies within many of these denominations. In short, the movement is far bigger than many realize and growing rapidly. Of course the time it takes to email all of these churches means we are lucky to canvas only one to two of the larger denominations a year. This explains in part why we see a tremendous surge in church numbers in one denomination one year (e.g. Episcopalian) and a different denomination the next. Of course emailing every single church in a denomination isn’t our only source of information. Churches contact us all of the time asking for inclusion or recommending another church they know. In addition, we still do our yearly reviews of the denominational and geographically based gay affirming organizations searching for new churches that have opened their doors to our community. Between these three sources, we find the vast majority of our new church adds. But more and more we find the bulk of our new church adds are coming through Eric’s prodigious denominational sweeps – this is extremely time consuming and limits our ability to accurately reflect the movements growing dimensions. I personally believe that the movement is growing rapidly and far more wide spread than our current means of canvassing the churches can capture. To accurately track the movement now we would need two things. First more people to assist in the church canvassing effort. And second the church web site and underlying database directory need to be updated to automate the process. If either of these two ministries strikes a chord within your heart and you would like to assist our ministry in this vital work – contact me at GALIP Foundation. The gay affirming movement within the Christian churches continues to expand at close to a double digit clip. At the same time the movement has expanded to eighty six different denominations spread across forty six countries. We have seen this growth reflected not only in our church directory but in the ten to twelve thousand new visitors we get every month searching for a church home and support for their Christian walk. Numbers aside, I believe we are seeing a fundamental shift in the movements proportions and scope. I believe a large underlying ‘grass roots’ swell of support is now propelling the leading edge of this revival. These affirming pastors and churches may not belong to their particular denominations gay affirming organizational body. Yet they are looking for others ‘like them’ who have opened the doors of the faith to everyone and anyone the Holy Spirit sees fit to send their way. In conclusion, I would like to thank Eric for his boundless energy and stead fast support of this ministry. Your hard work, support and encouragement has helped more than a few churches open their doors to our community. Without your tireless effort, countless numbers of people would not have found a church home. Together we have a front row seat to a marvelous work that is unfolding before our eyes and slowly transforming the Church into a more accessible place for all people to find Christ. It truly is an exciting time to be in the Lord’s service.